Stock Yards® Kings & Queens Steak Collection is packed with New York Strip steaks and our finest cuts of Filet Mignon. This is crowned our #1 steak lover collection. For over 100 years, Stock Yards has been providing the very best USDA Prime and Choice steaks, pork, lamb and veal to America's finest restaurants including: Chicago Chop House, Morton's, Tavern on Rush and Wildfire. While steaks of this quality are usually sold only to restaurants and steakhouses, Stockyards is one of the very few who can deliver them direct. Now, all can savor the flavor of world-renowned restaurant steaks at home. 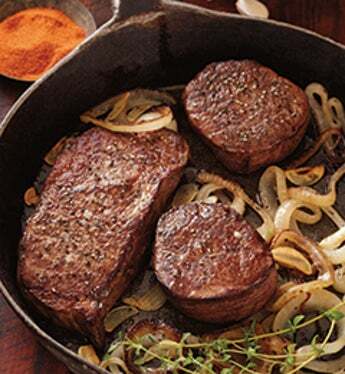 The Kings & Queens collection of high-quality cuts of meat includes; Center Cut New York Strip steaks, and Completely Trimmed Filet Mignon steaks plus Stock Yards Epicure Seasoning, which when used liberally before and after cooking, enhances the flavor of the steaks. Prime or Choice Cut? What’s the difference? USDA Prime. Only the top few percent of all beef produced in the U.S. qualifies for the USDA Prime grade. This distinctively superior beef contains the greatest degree of marbling, creating a tender and juicy steak with a buttery flavor. USDA Choice. This is the most popular grade of beef for its well-marbled texture and butter-rich flavor, giving it an exquisite tenderness and taste. Just over half of all beef graded each year earns a grade of Choice, and we only choose the highest quality Choice available. Packed with New York Strip steaks and our finest cuts of Filet Mignon, the Kings & Queen Collection is crowned our #1 steak lover collection.